Volkswagen UK offers 3 insurance products to VW owners. Motor insurance, 'Ensurance' and GAP. We'll take a look at them here in more detail. The Volkswagen motor insurance offering is much more than just another manfacturers scheme. It offers real benefits to those who want the best for their pride and joy. They ensure that a damaged vehicle will go to a authorised Volkswagen Paint and Body centre, be worked on by Volkswagen trained technicians and that only Volkswagen Genuine parts will be fitted. 'Ensurance' is a unique product offered by Volkswagen Insurance which adds many benefits. Unusually it can be added mid term and to your existing policy, even if that's not currently with Volkswagen. It's a sad fact of motoring but your cars value is reducing all the time. If your vehicle is stolen or written off you will only get a pay out from your insurance for the 'trade' value at the time. The average car depreciates by over 50% in 3 years so you could be well out of pocket. GAP (Guaranteed Asset Protection) insurance covers the 'gap' between your insurance payout and the invoice value of the car when it was new. That means if your car is stolen (and not recovered) or is beyond economic repair you will get your money back. The new car you then go to buy may have increased slightly but it won't be as painful as finding half the original value. GAP must be taken out at the point of sale but can be on used cars as well as new. 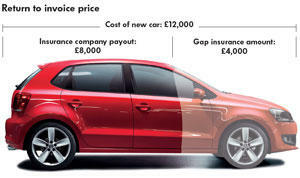 More information on Volkswagen GAP insurance is available here. VWGenuineParts.co.uk does not recommended or endorse any of the above as these products are regulated by the FSA (Financial Services Authority) and can only be advised or sold by an appropriately trained person or approved website.